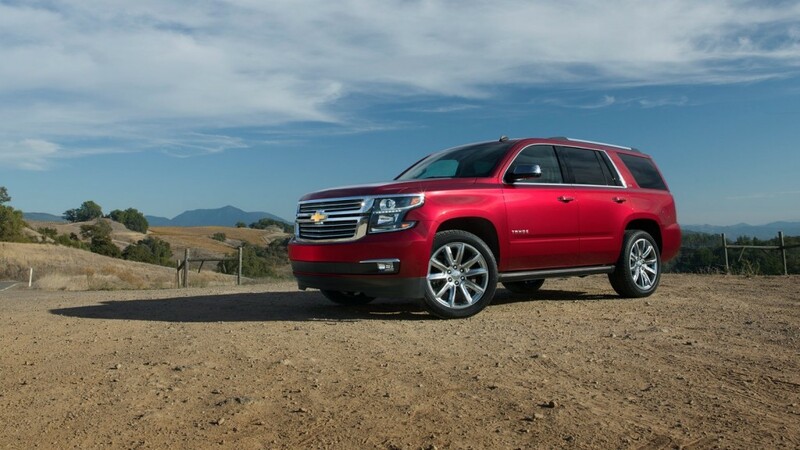 The 2015 Chevy Tahoe has received an update. Every so often, all vehicle models need a bit of an update. As technology moves ahead at a blistering pace, cars, trucks and SUVs are easily left in the dust if they don’t keep up with new advancements. Anxious to make sure that the Tahoe SUV stays ahead of the pack, Chevrolet has given this full-size SUV a full redesign for the 2015 model year featuring a new engine, improved aerodynamics and convenience, plus updated electronics. The 2015 Cheverolet Tahoe features three trim levels: the base level LS, the mid-range LT and the top-level LTZ. 2015 Chevy Tahoe – MPG receives an upgrade. For 2015 Chevrolet replaced the previous Tahoe generation’s Vortec 5.3-liter V8 with a new 5.3-liter EcoTec V8. Although this new engine is the same size, it offers increased power with a peak of 355 horsepower and 382 pound-feet of torque, enough to tow up to 8,500 pounds with the proper equipment. In comparing fuel economy estimates, the 2015 version gains nearly 10 percent in highway driving over the 2014 gasoline-powered models. (While the 2014 Tahoe included a FlexFuel version, the new model uses gasoline only.) Government estimates for both two-wheel-drive and four-wheel-drive Tahoes come in at 18 mpg for combined driving. Both versions also get 16 mpg in city driving, while the two-wheel-drive model achieves 23 mpg on the highway and a Tahoe with four-wheel drive gets 22 mpg on the open road. 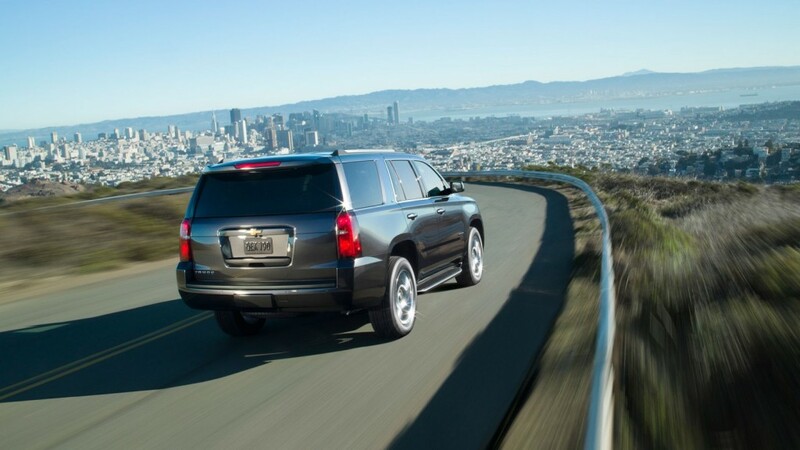 This increase in fuel efficiency is helped by some improvements to the Tahoe’s aerodynamics. The windshield is raked forward and doors now fit more closely within their openings to reduce drag, a design feature that also reduces wind noise inside the cabin. In addition, aluminum panels in the hood and liftgate reduce weight. Yet the all-new 2015 Tahoe isn’t all about power and efficiency. 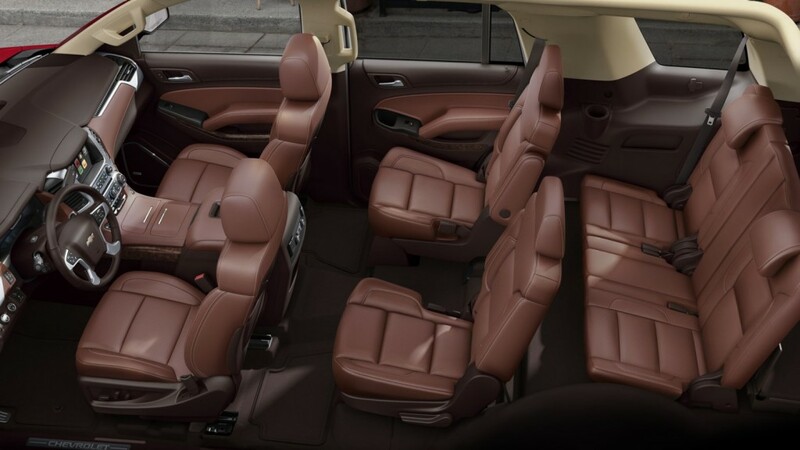 Comfort and convenience come into play in the redesigned SUV. The most dynamic difference between this year’s Tahoe and previous generations is that the third-row seat now folds down into the floor to allow more space for cargo. Previous Tahoe owners will undoubtedly applaud this improvement over the old third-row bench seat that had to be removed from the vehicle to switch over to cargo mode. An available power-folding feature for both the second row and third row to makes this transition a breeze. The only drawback to the new fold-down third-row seat is that cargo volume is reduced a bit in order to provide space under the floor for the folded seat. Available technology for the 2015 Tahoe takes several steps forward to keep drivers connected. 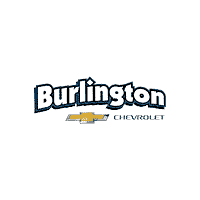 The latest version of Chevrolet’s MyLink electronic information and entertainment system includes Bluetooth audio streaming that syncs with selected smartphones. The system includes an eight-inch color touchscreen that also conceals a secure storage compartment in the dash behind it. MyLink is a standard feature of the LT and LTZ trims; buyers can also add an available navigation system. Throughout the interior, there are also six USB ports so even back-seat passengers can feed their music to the sound system. Technology also features heavily in the 2015 Tahoe’s safety components. It’s the only full-size SUV with an inboard driver-seat-mounted airbag. By inflating between the driver and a front-seat passenger, this airbag helps cushion both front-seat occupants during side-impact collisions. The new Tahoe has also added several technology-based safety systems such as rear cross-traffic alert, lane-departure and blind-spot warning systems, and adaptive cruise control that automatically adjusts the SUV’s speed to maintain a pre-set following distance and brakes if a collision is about to occur. A rearview camera and parking assist sensors round out the Tahoe’s new electronics.